New SFist intern Owen took a drive on it this morning and snapped us these photos. As you can see above, the six-lane tunnel is taking two-way traffic with a movable median in between, as it will for the next three years while what is to be the northbound tunnel gets built beside it. 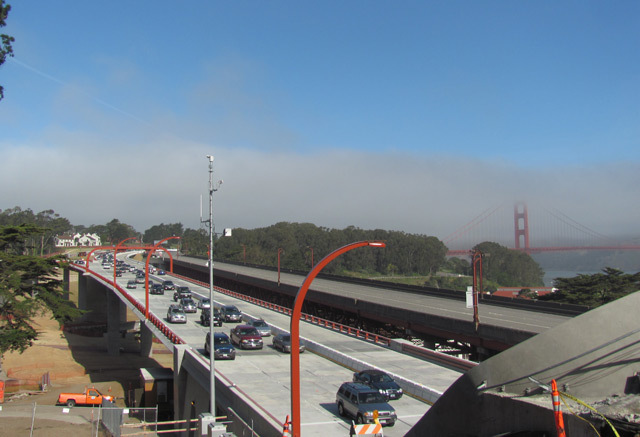 We believe that the eventual road is going to be called the Presidio Parkway, but for now, the Chron's still calling it Doyle Drive. Old habits die hard.